This started out as a tweet rather than a blog post but it’s going to take more than 140 characters. If I were microblogging, I’d settle for saying I disagree with Kelvin MacKenzie‘s views on getting into journalism and the mertits of college courses, and leave it at that. Disclosure: It is my personal view that if MacKenzie knew anything worth talking about with regards to journalism the Sun’s shameful and inaccurate coverage of the Hillsborough tragedy would not have happened. This is an editor whose paper published lies, who then apologised for those lies and then proceeded to backslide on that apology; should aspiring journalists really be influenced by his opinions? However, I can (just about) see the point he’s trying to make because my meandering journalism career path started when I left school, aged 18, and started on my local paper as a junior reporter. From there I progressed to a bigger weekly (which paid for my training and got me through the NCE) then on to daily regional newspapers; I wasn’t interested in broadcast, or the PA/nationals route. Eventually I wound up where I am now, editing a newspaper and a website. I’m not sure where Nobu is, or been invited to the Ivy, but I have had a damn good laugh over the years, and some corking stories (some of which were even printable). But as I’ve said before, I got my foot in the door of my local paper because my mum worked there and the editor knew me. Yes I had to prove myself after that but I suspect I wouldn’t have even got the chance without such an advantage. And from my own experience of interviewing prospective employees, some sort of benchmark is vital; not many candidates without some form of journalism qualification get far in the selection process on daily regional papers. That’s because it’s a brave interviewer who gambles on someone just because they sense a spark of something, with nothing other than a gut feeling to back it up. Probably that was an approach that worked a few decades ago but now? I suspect not. The traditional ‘promoted-to-a-position-where-they-can-do-no-more-harm‘ roles are dwindling. How many regionals now have full-time writers whose raison d’etre is solely to write a whimsical Saturday column and putter together the Looking Back round-up from the archive? If you take someone on, you’d better be damn sure they’re good (or willing to monster them until they quit – and that’s something else that doesn’t happen so much now, thankfully) because otherwise you’re adding a passenger to a stretched newsroom. But what to make of this, from Hold The Front Page, on April 8 (same day as the Indie article)? I don’t know, because the article doesn’t specify, whether these Motoring Journalism and Leisure Journalism courses are tailored towards print (if so, magazines, one would imagine/hope), digital media or broadcast, or whether past alumni have got jobs in their chosen specialities, or whether it’s geared (no pun) towards freelancers, but those are fiercely-competitive, niche roles if you’re planning on working in mainstream media. In regional papers where I’ve worked, press trips got handed to reporters as rewards or allocated in a names-in-a-hat basis. Leisure journalism? It’s often part of feature-writing remit, along with the ability to pen true-life stories, wax lyrical about interior design, and make celebrities sound sensible in print. I’ve met one journalist in my life –one – who’s job was to travel the world testing spa resorts; she worked for a high-end lifestyle magazine in the USA. Similarly, there aren’t that many motors journalist jobs in the regionals; these tend to buy motors copy off PA, retired ex-staffers who fancy tootling around in posh cars and writing about it, or from staffers who are enthusiasts (A colleague and I once set up a motorbikes section purely so we could play on fast, shiny bikes). Motors pages for national titles seems increasingly to be the preserve of celebrities, some of whom came through a journalism route. That leaves broadcast and digital media, of course, but the number of jobs on offer is so vanishingly small, and the competition so fierce, would you run up student debts on the off-chance that you would get a post in your speciality straight away? No wonder there were only three subscribers for the motoring degree, and none for leisure. Those three have moved to the journalism course which is, I reckon, a far safer bet for them and a much better investment of their time and money. Many journalism colleges do a good job of providing entry-level journalists for local papers (I can’t comment on broadcast courses but I’ve seen print colleagues who came through the college route cross into TV after excelling in video journalism while working for their local papers). And it’s a sweeping generalisation for Kelvin MacKenzie to describe all courses are ‘make-work projects for retired journalists’. There are a number of journalism educators whom I admire and who definitely don’t need me defending them because it’s an indisputable fact that they are excellent at what they do. If and when newly-qualified students do get a job with their local newspaper, of course they will continue to learn. I’ve been doing this for 20-odd years and every damn week I learn a new, sometimes harsh, lesson; I bet lawyers, teachers, civil servants and care workers say the same thing. Learning on the job is not unique to Journalism. Ironically, in the penultimate paragraph he asks: “What do you need to know about the law? If you want to avoid libel a) be accurate and b) have the goods. If you haven’t got the evidence you’ll get sued”. 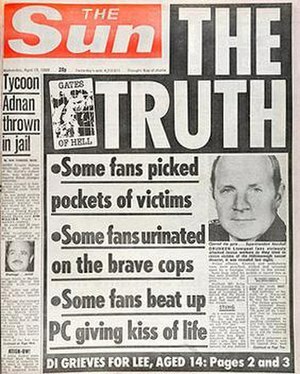 So here’s a final thought from me: Just where was the evidence for the Sun’s Hillsborough front page?